Home Blog NURU PLeasure a massage gel in powder form. The nice thing about NURU PLeasure powder is that you can use it to make two different kinds of massage gels. 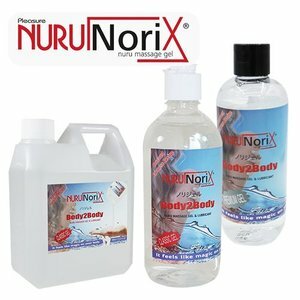 When you choose to mix 5 grams of NURU PLeasure powder with 500 ml of water, you will create the Norix Classic Nuru massage gel. When you decide to combine 250 ml of water with 5 grams, it will produce the thick Premium Nuru gel. Of course, it is always possible to further dilute the gel with some extra water during the massage, if you should desire. This way, it is certain that you will always have the opportunity to enjoy a nice, long, intense massage with a Nuru massage gel. How do you make your own massage gel with NURU PLeasure? By now, you know that it is possible to make your own quality massage gel using NURU PLeasure, but how does this process work exactly? Firstly, it is necessary to have, for example, a 500 ml glass bowl at your disposal, so you can calmly strew the powder across a substantial surface area. It is now up to you whether you will fill the bowl completely or only half of it, depending on the massage gel you wish to make. During the next step, you calmly stir the water with a wooden or plastic spoon and add 5 grams of Nuru powder. You should keep stirring for about 2 minutes. It is important to take into consideration that the Nuru powder is distributed correctly across the whole surface area of the water. When this is done, you should let the mixture rest for about 15 minutes. The NURU PLeasure will do its work during this time. Taking a warm shower in the meantime can help to get you in the right mood already! After 15 minutes, the massage gel you made with Nuru Raw is ready to be used. This massage gel will undoubtedly let you experience a good deal of delightful, intimate moments with your partner. In essence, the effect of NURU PLeasure is no different from ready-made massage gels. So, it is likewise best applied on a damp body and a smooth surface.